Asby is a parish in the area known as the Orton fells, famous for its limestone rock formed some 350 million years ago beneath a warm shallow sea. About 8000 B.C. in what is known as the Mesolithic era, or the Middle Stone Age, the first Asby residents arrived from Europe. Anglo Saxon invaders occupied much of the Westmorland area forming small farming communities and parish areas with a church, the old Asby church of St. Peter being one. The manorial system gradually weakened and in Asby around the 16th century, as in most rural parishes, the Parish Church ‘Vestry’ system of local government came into being. …with thanks to John Smith. Scroll down to "Asby parish" in the left sidebar. b) Cumbria Family History Society. We have an active History Group which meets regularly in Asby Village Hall. * Figures from The Cumbria County History Trust and the 2011 UK Census. Joseph Clement was born at Great Asby in 1779. His father was a hand-loom weaver. He was educated at Asby Endowed school and then set to work assisting his father at the loom. Weaving by hand was being replaced by machines and his father resolved to put his son to a better trade. His father decided to make him a thatcher, afterwards a slater, and he worked at that trade for five years, between the ages of eighteen and twenty-three. He had always been interested in metalwork and during winter, when slating was in short supply, he worked with the Asby Blacksmith learning the trade. He learnt how to manufacture tools, including lathes upon which he turned the components for musical instruments, which he himself learnt to play. Joseph later moved around the country learning more about the manufacture of metal tools, lathes and metal planers, also learning how to produce scale drawings. Clement became amongst the finest toolmakers of his generation, both gifted and inventive, winning acclaim and awards for innovations in machine tools. Clement was a toolmaker as well as a first-rate draftsman – a rare combination – and was hired by some of the great pioneering engineers of the day, including Joseph Bramah and Henry Maudsley. Babbage hired Clement sometime in the mid-1820s to make Difference Engine No.1, a calculating machine. Babbage designed and sketched the mechanisms and Clement made them, often devising specialized tools in the process. Their collaboration was close and it is impossible to say how much of the detailed implementation is Clement’s and how much Babbage’s. Clement made the ‘beautiful fragment’ – the demonstration piece for Difference Engine No. 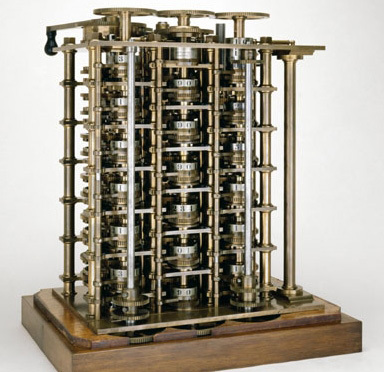 1 delivered to Babbage in 1832 – one of the finest examples of precision manufacture of the time. In a real sense Clement can be said to be the first computer engineer. Unfortunately Babbage never completed his machine as his funds ran out. The first entire Babbage Engine was manufactured in London in 2002, 153 years after it was designed. Difference Engine No. 2, built faithfully to the original drawings, consists of 8,000 parts, weighs five tons, and measures 11 feet long. 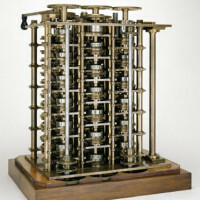 The difference engine is widely regarded as the forerunner to modern digital computers. In later years, Clement returned to music and constructed an organ. He died on 28 February 1844. Watch a fascinating video of Babbage’s work, including a demonstration of the Science Museum’s Difference Engine No. 2. Brian Loomes, a clock restorer, of Pateley Bridge, has researched the history of the very famous clockmakers, the Powley family of Asby Parish. Mr. Loomes has identified the individual clock makers and he has agreed to allow the parish to use the details from his work which has been pieced together from various sources including genealogical information supplied by a descendant. The Powley family made longcase clocks mainly in Asby during the 18th Century for a period of nearly 100 years. Most of the components were manufactured from locally sourced metal, probably from the Asby Winderwath copper mine. Their clocks are very valuable and much sought after. The first family member who may have made clocks was John Powley of Asby, who married Ellen Willan in 1679. 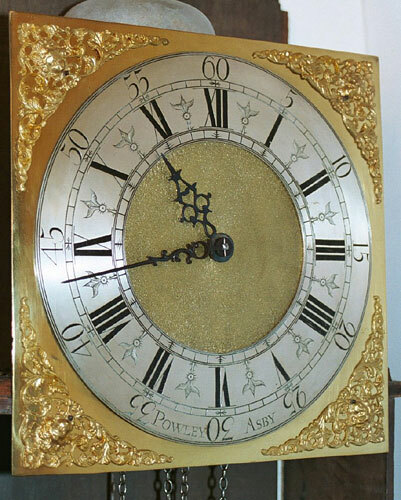 Clocks do exist which appear to be as early as the 1720s signed as ‘J. P. Asby’ and ‘I. P Asby’, (I and J were then interchangeable in capital lettering) but the style of their clocks is deceptive and it is possible such clocks were made by John Powley (II), grandson of John (I). William Powley was the eldest son of John, born in 1681. William was married in 1707 to Agnes Taylor, who bore him at least six children between 1708 and about 1720. 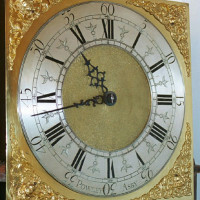 Clocks are known which are clearly signed by William Powley of Asby, but others exist such as one signed ‘W. P.’ , numbered 85 and dated 1766 (when he would have been eighty five years old!). In fact William had a namesake son, born in 1714, and it might just be he who made the WP clocks, which would sort of make sense alongside the work of his brother John’s I.P clocks. William had two further sons, Thomas and Robert who kept the Powley clockmaking dynasty going until the end of the end of the 18th century. Anne Clifford was born at Skipton Castle on 30 January 1590, during the reign of Elizabeth I. 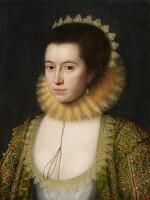 She was the third and only surviving child of George Clifford, 3rd Earl of Cumberland. When she was 15, her father died. She was upset to find she did not inherit her father’s vast estate, her uncle got it instead. From that moment Anne’s mission in life was to regain her inheritance. Having married the Earl of Pembroke, it was only in 1643 that she finally achieved her ambition. In 1649, and with the Civil War raging, she came north. At the age of 60 she spent the next 26 years energetically rebuilding several of her castles, including that at Appleby-in-Westmorland. As a devout Christian she also built and restored churches and almshouses. She died at the age of 86 at Brougham Castle, though her tomb may be found in St Lawrence’s Church, Appleby-in-Westmorland. 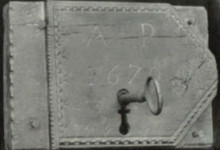 Locksmith, George Dent of Appleby, supplied a number of locks to Lady Anne. She had a habit of giving away these locks which she purchased at a guinea (£1. 1s. 0d). 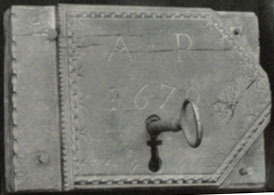 They were engraved with her initials A.P (Anne – Pembroke). One was given to her steward George Sedgewick and another to the Rector of Asby. The award to the Asby Rector, George Theobald, was because he and his family gave her and her retinue shelter during a ‘terrible storm’ in 1670. Lady Anne’s account book for 1673 says: ‘paid to George Dent of Appleby for two great large stock locks he made for me to give away – £2.02.0d’. Why she chose to give locks is unknown. However, it was about this time that locks were being introduced as a security measure and, at a guinea a piece, were very expensive. The large upper room in the rectory’s Pele Tower at the time of George Theobald has been called ‘The Queen Anne Room,’ clearly it should have been ‘Lady Anne’ but that was how the name stuck. This room was in fact the largest and best room at that time and would have been made available for her. 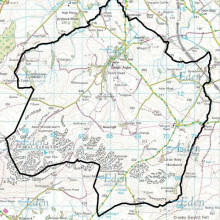 The parish has always remained rural in nature with the population peaking in 1881 at 496, falling away to 309 by 2011. Farm machinery replaced many farm labouring jobs but the largest population change was due to The Industrial Revolution, with people moving to towns for work. During Victorian times the larger population of Great Asby supported a saw mill at Dale Beck, a Carpenter, a blacksmith, three shops and a post office, a watch maker and a longcase clock maker. All these businesses had ceased by the late 20th century. Steadman was born at Asby on February 20th 1846 and lived at Scale Beck. At his peak he had a very large following. He was an all-round athlete in his earlier days, winning prizes for sprinting and hurdles, before he began to concentrate on Cumberland and Westmorland style wrestling. He was farmer, but he won hundreds of cups, belts and medals, in a wrestling career that spanned 35 years. He began by causing a minor sensation in 1868, defeating William Jamieson, the recognised champion of the day, at Manchester . 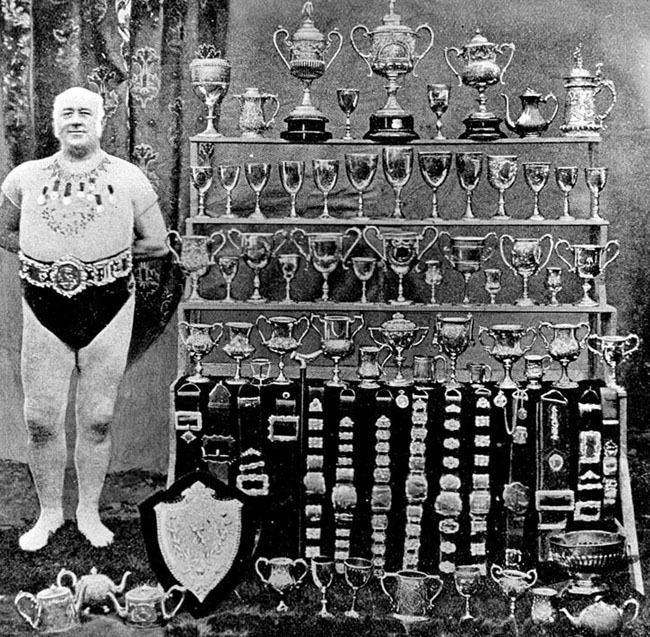 In 1869 he won a prize at a wrestling tournament held at the Agricultural Hall on Liverpool Road, London and went on to repeat that feat every year for the next 31 years. In February 1892, he challenged an American Wrestling champion to 5 bouts using 5 different styles, ‘Catch as Catch Can’, ‘Graeco Roman’, ‘Scottish’, ‘Collar-with-Elbow-with-Jacket’, and ‘Cumberland and Westmorland’. Steadman won 3 of the bouts, collected the £200 stakes and the title of ‘Mixed Wrestling Champion of the World’. By the time he retired, he probably had won more money at wrestling than any other wrestler up to that time. 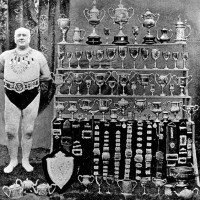 Altogether he won at least 60 cups, 20 belts, hundreds of medals and won 17 Heavyweight championships at Grasmere, before retiring in August 1900 (as World Champion) ‘to give these younger ones a chance’. He was still wrestling in exhibitions at Grasmere in 1902, only 2 years before his death, on March 5th 1904 at the age of 59. The manorial system gradually weakened and in Asby around the 16th century, as in most rural parishes, the Parish Church ‘Vestry’ system of local government came into being. People living in the parish attended an annual open church meeting presided over by The Rector and church wardens. The people elected parish constables, ‘poor house’ keepers, overseers of the poor, overseers of the highways, and the church wardens who were also responsible for the control of vermin in the parish. The appointments usually lasted for a year unless re-elected. The Vestry also supervised the right of settlement in the parish, vagrancy matters, providing materials for the unemployed, the burial of paupers, and the apprenticeship of children. This system continued well into late 19th century until Rural District councils and County councils came into being. The first Asby parish council was elected in 1894 to deal with minor matters. In 1157 King Henry 2nd re-conquered the area and placed the Norman Baron Hugh de Moreville in charge of the Appleby Barony. He split Asby into three, Little Asby manor, Asby Cotesford manor on the south side of Asby beck, and Asby Winderwath manor on the north side of Asby beck under the control of his selected Norman overlords. Courts Leet were set up controlling manor events and land use. The overlords gave some land to Byland Abbey for growing crops to support the abbey and other land was given to The Order of St. Leonard and St. Peter’s of York to supply their hospital in that city. St. Peter’s church also held small areas of land mainly for Tithe storage. The 15th Century Old Rectory, once a Pele tower, was probably built on donated land. Baron Hugh de Morville was involved in the murder of Thomas Becket at Canterbury. In 1174 he sided with the Scots who invaded England. At the battle of Alnwick later in the same year, The King of Scotland with Hugh de Morville and his aide, Alan de Lascelles were captured by the forces of Henry 2nd. Moreville had his lands confiscated and sent to join the Knights Templar in Jerusalem. He never returned. The Asby Cotesford manor until this time had been held by Alan de Lascelles, his land was confiscated and handed by the king to Richard de Cotesford. At the time of the Norman invasion Asby and Westmorland were in Scotland. The year 1066 marked the Norman Invasion of England but William the Conqueror did not reach our area. It was not until 1092 that his son, William Rufus, took Westmorland and Carlisle and incorporated the area into England. Being in Scotland until 1092 Asby does not appear in the Domesday Book. William Rufus handed the churches of Westmorland, including St. Peter’s, to the control of Arch Bishop Thomas of York. In 1133, these ancient churches were handed to the newly formed Diocese of Carlisle by King Henry 1st. St. Peter’s has remained an independent Rectory ever since. Wars with Scotland continued. The Civil war between the forces of Stephen and Matilda for the English Crown ended with a successful Stephen in 1135. Stephen gave King David of Scotland the Westmorland area in thanks for his support during the hostilities. Asby moved back to Scotland under the control of the Norman ‘de Moreville’ family. 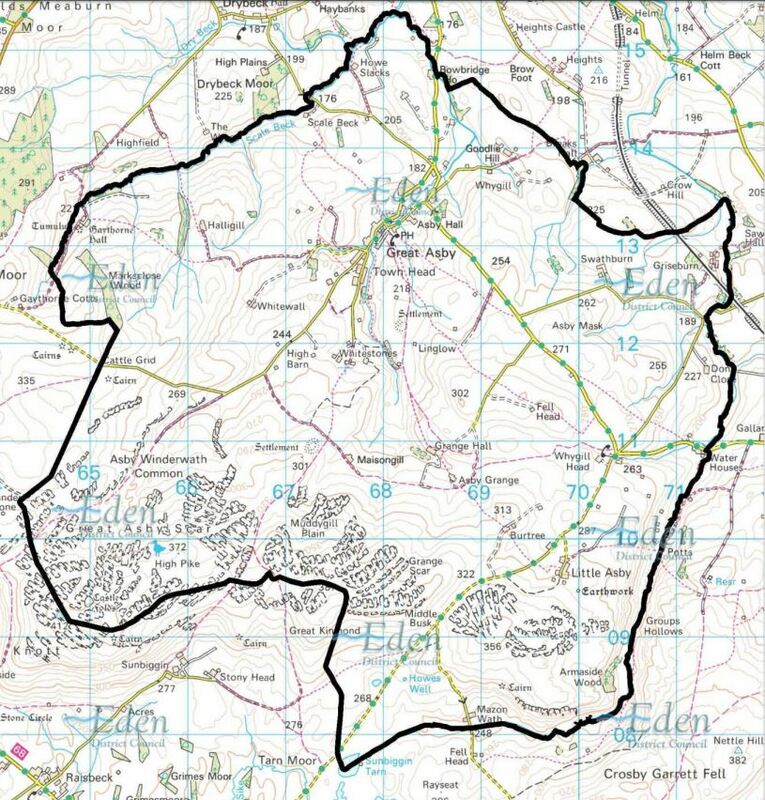 The Barony of Appleby was formed. The period following the Roman withdrawal is commonly known as the ‘Dark Ages’. In respect of Asby, it was a time of change. Anglo Saxon invaders occupied much of the Westmorland area forming small farming communities and parish areas with a church, the old Asby church of St. Peter being one. During this time the parish name ‘Asby’ came into being. The Scandinavian name for Ash is ‘Aske’ and ‘By’ means a farmstead or homestead. A farmstead in an area of ash trees. In ancient documents the parish is named ‘Askeby’ changing to Asby over hundreds of years. Many parishes in the Eden area contain the ‘by’ suffix. During 1993 what is known as ‘The Asby Hoard’ was discovered on Asby Winderwath Common. The hoard consisted of 115 items of metal work, mainly iron tools, keys and strap ends but included a copper alloy plaque. 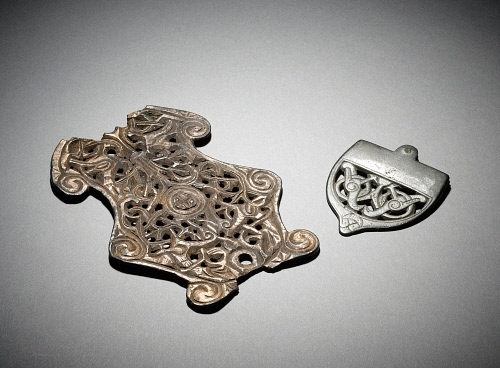 Archaeologists believe the hoard could be a Viking stash never recovered. The items are now in The British Museum. This copper alloy plaque, part of the “Asby Hoard” has a gilded surface decorated with two pairs of animals surrounding a central cross. The plaque has been identified as 8th century Northumbrian, religious in origin. The major tribe in the north of England was the Brigantes, believed to be a conglomerate of smaller tribes. Historians believe that a further tribe, possibly a one time sub-tribe of the Brigantes, known as the Carvetti, occupied Asby and the surrounding area; their early tribal base being at Clifton Dykes. Following their invasion, the Romans were generally at peace with local tribes. 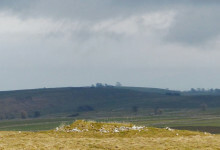 It is believed that the Romano-British settlements at Holborn Hill, Maison Gill, the fortified settlement of Castle Folds, and others were occupied by the Carvetti in early Roman times. It is probable that some of these settlements would have been inhabited prior to the Roman invasion. 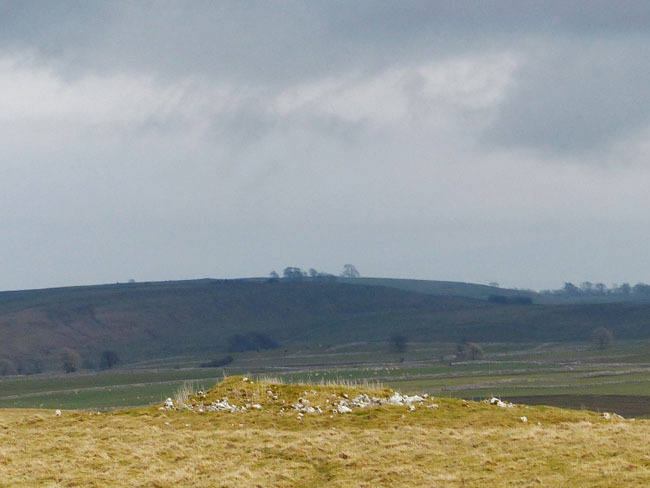 During the Roman occupation, the area below Hadrian’s Wall, including Asby, was the Roman military frontier area. The inhabitants no doubt provided the Romans with supplies, hence the Romano-British settlements. The find of a Roman Brooch at Little Asby and the recent famous Roman Cavalry helmet find at Crosby Garrett, close to the Little Asby border, further confirm Roman activity in this area. Periodical uprisings by the Brigantes against the Romans and local tribal conflicts continued until the Romans left Britain after some 400 years of occupation. This conflict was probably the reason that Castle Folds settlement was very remote and heavily fortified and meant for use in times of trouble. 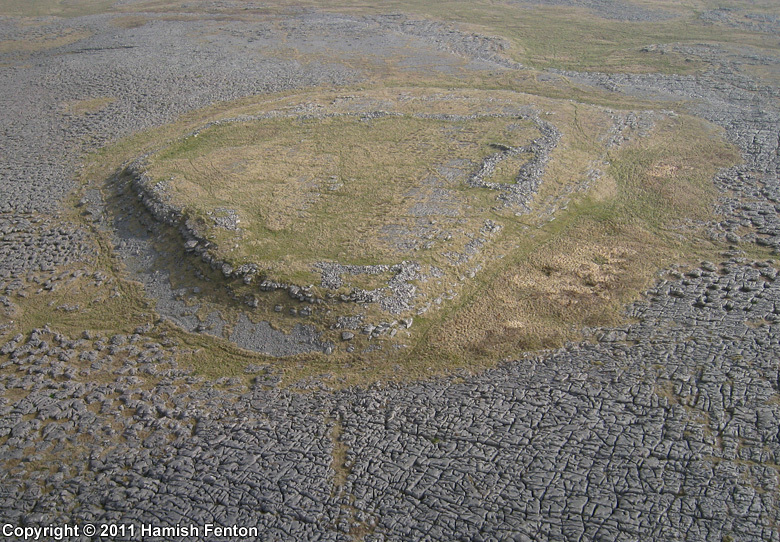 The Roman0-British settlement of Castle Folds may be found on the southern part of Great Asby Scar, just north west of Sunbiggin. About 2300BC the new Stone Age gradually gave way to the Bronze Age when tools, weapons and implements began to be made of copper and Bronze, an alloy of copper and tin . In Asby evidence of the Bronze Age has been identified on Little Asby Scar with possible evidence of ancient copper extraction in the Potts Beck area. Around 700BC iron gradually replaced many bronze and copper items. 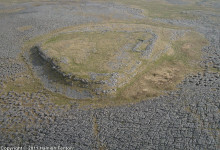 A recent discovery indicates a possible Bronze Age site with a later Iron Age settlement by Whitley Crag in the Parish. (This site has not yet been fully examined.) The Iron Age continued into the Roman era which began in 43AD with the Roman initial conquest. From the Neolithic era onwards people lived in family settlements. Over time the settlements gradually became larger and became villages with a mixed population, often surrounded by a wall or earth bank with huts inside. The family head was replaced by a village head and communities became tribal. This was the case at the time of the Roman invasion. ‘Hollin Stump’ is a round cairn which can be found off Sayle Lane, on the left just before the cattle grid heading towards Gaythorne. When opened in Victorian times it was found to consist of two cists. One contained human bone fragments and the other a human skeleton. Amongset the other findings were the skull of a horse and an ancient knife. About 8000 B.C. in what is known as the Mesolithic era, or the Middle Stone Age, the first Asby residents arrived from Europe. They were hunter gatherers and had no permanent settlements or agriculture. However they left remains of stone implements mainly in the Little Asby area. The Asby flora and fauna must have suited them as well as the later settlers of the Neolithic era, or New Stone Age, from about 4,000 B.C. onwards. Neolithic flint fragments, implements, axes and arrowheads have been found in the parish. It was during the Neolithic period that agriculture developed, suggested by evidence of land clearances and the results of pollen examination. Small family villages were settled and stone burial cairns and barrows were constructed, a practice continuing into the later Bronze Age. The remnants of several cairns and barrows are present in the parish. Asby is a parish in the area known as the Orton fells, famous for its limestone rock formed some 350 million years ago beneath a warm shallow sea. 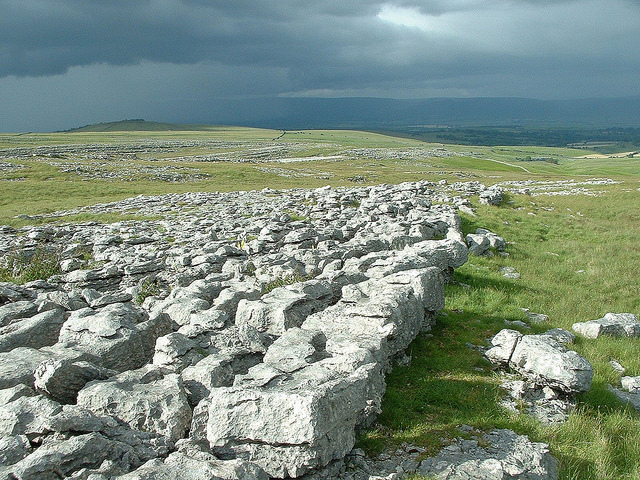 The Limestone of Asby has been shaped by ice age glaciers, tectonic plate movement and general geological changes over the millions of years since. The last glacial period ended about 10,000 B.C. 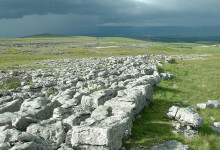 exposing the limestone and subjecting it to weathering which has created deep fissures, or grikes, which divide the pavement into blocks called clints. This weathering left a unique area for flora and fauna to flourish. The parish was once quite heavily forested with Juniper, birch, elm and ash. Game was aplenty. Great Asby nature reserve reveals rock formations of geological interest, while specialised plants grow within the grikes and clints.